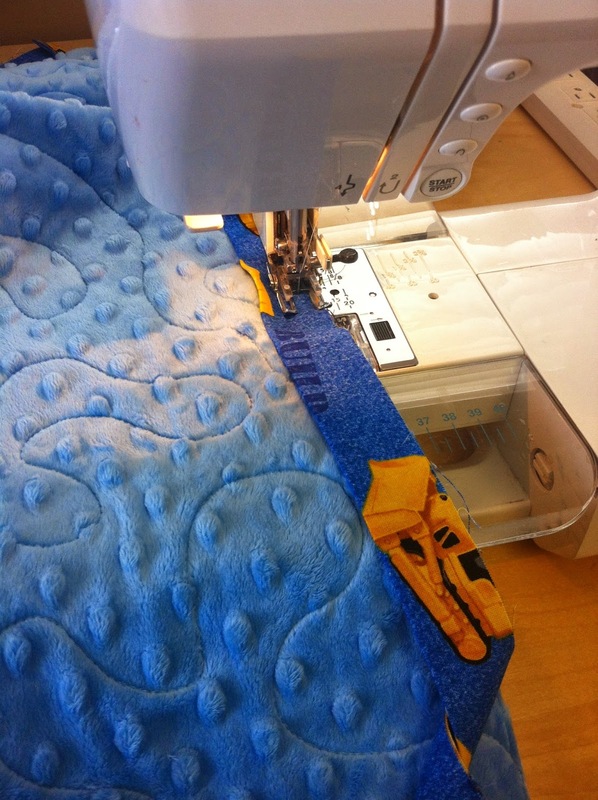 Once in a while, I need to put my sewing for Magpie Quilts on the back burner and make a quilt for someone close to me. Last November, we welcomed our 3rd grandson into the family and I made him a quilt from a panel my husband bought in Fort McMurray while there on business. I am sorry I didn't take the time to take a decent picture of the whole quilt, but I'm sure I'll get a chance sometime! Originally I had set aside some ivory Minky for the backing, but for some reason, it didn't quite seem to be the right colour for this quilt. I finally went and bought this sky blue Minky dot and it worked perfectly! 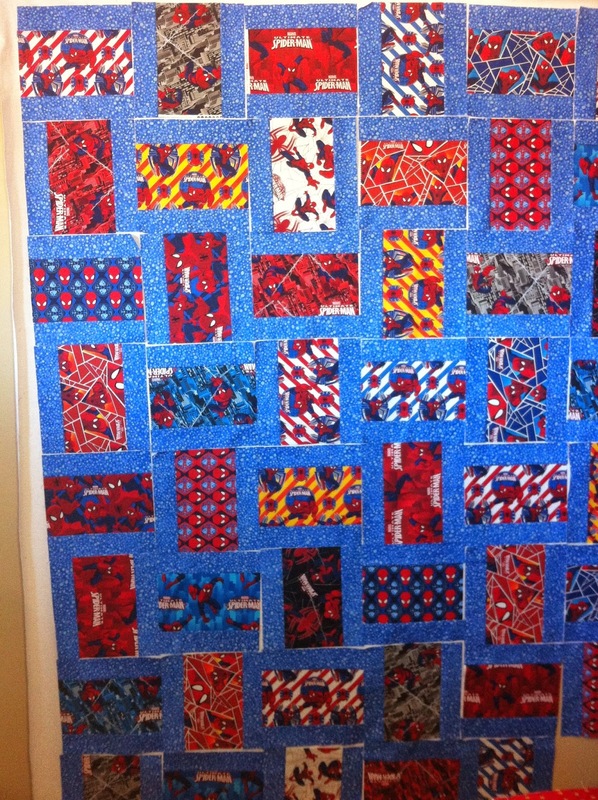 And the newly minted big brother and middle child requested a superhero quilt for his big-boy bed and while I've had the fabrics for quite a while, I only recently figured out what pattern I was going to use and finished his quilt top and it's now at the quilters. Pattern is called "Six and Ten", I don't have a link or a source, but it was easy enough to do. 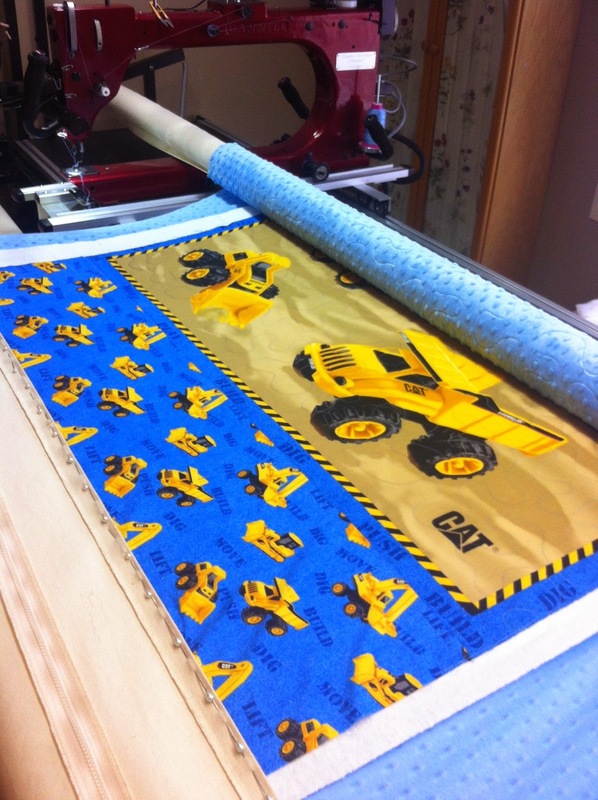 The blocks finish out at 10" square, so for each block you need a feature fabric of 6.5"x10.5" with a 2.5"x10.5" strip of the background on either side. Make as many of these as you need (I made 42 for a 6 block by 7 block quilt) and alternate the blocks one horizontal, the next vertical. Sew together! So, sometime in the near future, I'll have full photos of these two boy quilts for you to enjoy!